There was so much wrong with this book. I don’t think I’ve hated reading something so much in my life. The characters went nowhere—yes, they flew across the world using Daniel’s mighty angel wings—but their personalities just felt flat. Luce was so overdramatic, practically unable to function whenever anybody was injured or died, regardless of whether she’d just met them a few pages ago. I guess it was meant to make her seem compassionate, but it just felt hollow. And the plot holes—oh, the plot holes. I was immensely angry at this book whenever something just didn’t make sense. There were so many moments where it was like, ‘Forget we’re all here, only Luce can do this…’. With over four hundred pages, this book just dragged on and on. A lot of what happened felt like filler, especially with all that the book amounted to. 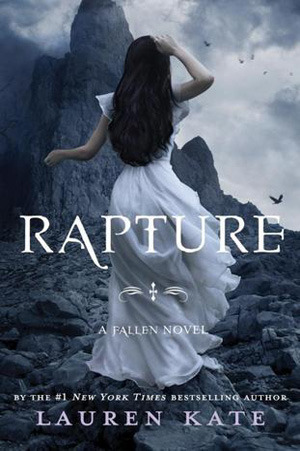 A great chunk of the book was just Luce and Daniel and a bunch of random angels, Outcasts, Scale, and other weirdly named angel-variants traipsing around Europe looking for three relics to reveal the spot where the Lucifer’s recreation of the Fall would land. Apparently Daniel had written a book telling them all they needed to know years ago, but he’s since forgotten what he wrote. Yeah, crap like that happens frequently. With only nine days to stop Lucifer, they seem to waste a lot of time doing random things I didn’t care to take note of. None of it really mattered in the end, in fact, I felt like I’d wasted weeks of reading time stuck on this book. At one point, Daniel told Luce that she could simply will herself to overcome mortal limitations anytime she wants. So she wills herself to stay alive. It made any danger she was put in pointless. For instance, when she’s being choked, she just goes on like nothing was happening. WHY? Suddenly, she realised that this was the very first time she and Daniel had met on earth. This was the moment she’d been begging for, the moment Daniel would never talk about. Neither recognised the other. They were already, instantly, in love. Luce had once loved to solve complex calculus proofs. We belong to each other. Daniel is my everything. Sunset was the time you wore things you’d washed and dried. What happens in pajamas stays in pajamas. If it weren’t for the plot holes, the annoying characters and the slow, boring plot, I probably could have enjoyed this book a bit more. I just felt so frustrated at all of the situations Luce had to face on her own for no other reason than ‘because’. The explanations for the whole plot of the series weren’t that great either, especially considering how many people had to die. I yelled, I rolled my eyes, I slammed the book shut. Luce and Daniel, they’re certainly not a pairing I would root for. Recommended to: Anyone who feels the need to finish the series. If not, I’d probably skip it. I read the first book and enjoyed it, but never picked up the second book. The ending of the first one reeked of love triangle too much and those were all the rage (still are it seems) and I can’t stand love triangles. I had a similar opinion to this… I absolutely loved the first book, but to be honest I struggled with the rest, I’m not even sure that I have read the last one, and I have the newest one; Unforgiven, on the shelf but haven’t read that yet either!